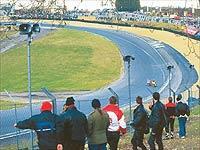 Octagon have denied they are planning to sell circuits including Brands Hatch, Snetterton, Oulton Park and Cadwell Park. The claims were raised in subscription newsletter, TV Sports Marketing. Octagon’s Ruth Wicks said, " It just isn’t true. It won’t happen. We did look earlier this at the possibility of doing something with two of the circuits, Snetterton and one of the others, but we decided not to progress it. " Comment on this story on our British Superbike message board by clicking on the link on the right.